Ever just want to grab your girls and have a girls night in? Catch up, and enjoy each others company (and laugh your @$$'s off all night?) 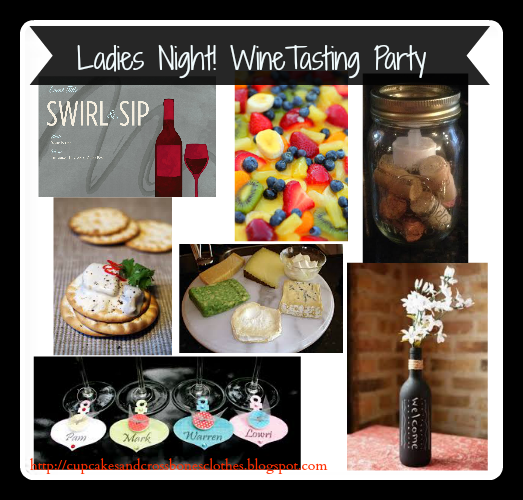 What better way to have some fun and relax than having a wine tasting party? You can make this as casual pj party! or as fancy as you like, either way everyone is bound to have a great time and enjoy some delicious wine! For a casual gathering head over to evite. Pick that perfect wine themed invitation, a date, time, and place, and email your free invitations to all of your friends. You will get updates emailed to you once someone has replied to the RSVP which is great; and don't forget to instruct your guests to bring a bottle of wine that they would like to add to the selection of wines that you all will be trying out. A tray of assorted fruits along with a selection of crackers and yummy cheeses is perfect for an evening of wine tasting! Quick, easy, and satisfying. -Wine Bottle Flower Vases- Use your empty wine bottles that you have saved for crafting and spray them with chalk board spray paint. Once COMPLETELY dry, use chalk that you can pick up from the dollar store to write welcome notes on your bottles, or draw pretty designs. Lastly, head to your local grocery store and pick up some fresh blooms to compliment your vases and add color and life to the room. The best part is that you can erase the notes and reuse them again for another gathering that you may have in the future! -Candle Holders- Create a beautiful ambiance with soft candle lighting. Grab your trusty mason jars and fill them with wine corks as shown above (did you know that if you haven't been saving your wine corks, that you can buy them here?) Next, place a battery operated tea light candle in each mason jar for a safe and beautiful touch! Create simple and adorable favors for your guests by allowing them to leave with a wine glass and glass charm! You can pick up wine glasses from your local dollar store and place them on your table with a different wine charm around each stem (great so people do not misplace their drinks). When your guests leave provide them with a cute gift bag to take their glass and charm with them and also place a bowl of assorted chocolates out on your table so they can throw a few in their gift bag as well. Have you ever had a wine tasting party before? What tips can you share with us? I love your idea for the favors. The chalkboard wine bottle is too cute! I love wine tasting so you get to taste wine you may have never picked. Thanks! It is so great seeing (and tasting) what wine choices your guests bring.